One of the most difficult aspects of working from home is time management. The lines tend to blur between personal and professional work. Online research quickly degenerates into rabbit trails. One of these interesting rabbit trails recently led me to an article on “How to Deal with Distractions in a Web Worker’s World” at the Lifehacker site. The article gives good advice I already implement, such as taking regular breaks and using different spaces for different work. This morning I noticed that article’s link on how to “Use a Daily Log to Keep Yourself Focused on Productivity.” At the advice of my fellow work-at-home friend, Angela, I’ve used an Excel timecard for years. And I’ve journaled for many more years. But the idea of a log appealingly incorporates elements of both in a more immediate format. I often find myself looking at my timecard and thinking, “What have I done for the last two hours?” Or worse, “What have I done for the last two days?” I’m beginning a log today as a more immediate way of tracking my time. 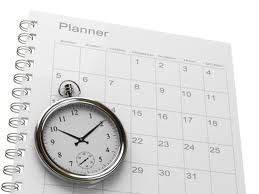 My most effective time management tool came from an interview with the prolific writer Leland Ryken, who revealed that he often works in two-hour blocks. That sage advice has been extremely helpful. Limiting myself to two hours on one task forces me to focus. And after concentrating hard on two hours of writing, my finite mind is ready for a brief break before tackling something new. But I confess that my overloaded brain sometimes seeks respite by squandering precious minutes playing Free Cell. Who am I kidding by thinking I’m keeping Alzheimer’s at bay? What things do you do to keep on task while working at the computer? How do you structure your time in your home office? I’m glad I’m not the only one who has had to find a creative solution for time management. My method is to us a Windows gadget called Activity Tracker. I can track the time I spend on all the different activities I engage in (research, writing, office organization, etc.) and easily switch back and forth between them. At the end of the day, I total them up and include them in a report I send to my supervisors. It may not be a perfect solution, but it works for me. Thanks for sharing that, Norlan! I’m going to check into Activity Tracker. The most effective methods are the ones that take the least amount of work to maintain daily. I set a timer for thirty minutes at a time and write on my writing days. Free Cell doesn’t help stave off Alzheimer’s? hmm. What about Sudoku? Here are the games I love…Cyviballs and SunnyBoom are the best! I’m sure they are good for my brain. I’m sure Sudoku staves off Alzheimer’s! Thanks for the timer tip, Sally.